Our annual list of the 10 best planning, design, and development websites (along with a few honorable mentions) represents some of the top online resources for those interested in planning, design, and development. We've listed the websites alphabetically, with host organization listed in italics if different from the website name. This list is based on nominations by Planetizen readers and staff, and judged against a common set of criteria, including standards of web accessibility. The engrossing posts on this blog cover topics as various as singing roads and Antarctic substations – but somehow they all connect back to the shared themes of cities, architecture, design, media and culture. Penned by Dan Hill, a Swiss-born Englishman living in Sydney, Australia, City of Sound is consistently well-written, thoughtful, and surprising. Honorable Mention: WebUrbanist -- another standout blog that blends cities and culture. 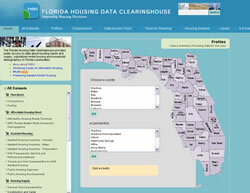 Founded in 2000, the Florida Housing Data Clearinghouse's website is a great example for agencies who want to provide easy access to relevant data and statistics. Visitors to the site are greeted with a map of the state, and can drill down into individual cities and counties to retrieve figures affecting the availability of affordable housing. Users can find population growth projections, new construction and sales data, and housing and wage trends with well designed data access tools that allow comparisons by jurisdiction – handy for planners looking to measure up to the town down the road. Honorable Mention: Urban Design Tools - Low Impact Development -- a useful site for planners looking to learn more about stormwater managment techniques. These two web tools by software developer Gregory J. Brail combine transit data and Google Maps to create the easiest way yet to figure out how to get somewhere using public transit (at least in New York and London). By simply clicking (or typing in the address) of your starting point and destination, these interactive transit maps instantly plot the shortest travel route using each city's underground metro. Even Google's own Transit website doesn't provide such easy point-and-click trip planning. 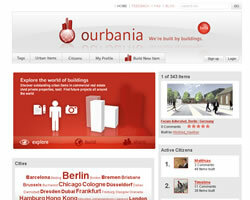 Ourbania is a fun, interactive site that lets you explore the world through its buildings. Supported by an online community of "real estate enthusiasts," the site encourages visitors to post information about real life structures - from bridges to skyscrapers - to its online community. Users can add photos and notes, and plot a building's location using a Google-powered map. Like the design of certain building? Visitors can find out the architect, and see what other buildings they might have designed (provided they are uploaded to the site). With a large base of international members, Ourbania lets anyone who's interested in buildings connect and share information. With global warming increasingly on the minds of the people in charge of managing cities, many officials are looking to learn more about sustainable urban policies and practices. 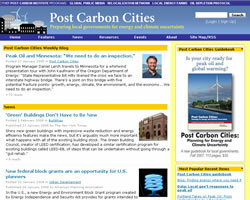 Post Carbon Cities has taken up the challenge of helping local governments understand and respond to the challenges of peak oil and global warming by bringing together a valuable set of resources on energy and climate change. The site's weekly blog provides overviews and advice on topics such as green building and transit-oriented development. A Planetizen reader favorite. David Daddio and Rob Goodspeed, two planning students at the University of Maryland, wanted to put their planning and technology skills to work to help the college town of College Park, Maryland. The result is Rethink College Park, a user-friendly website that provides community members with updated information on plans in the community, as well as a way to discuss proposals. The site features an active blog and an interactive development map that plots development projects and proposed transit routes. Honorable Mention: Ballpark and Beyond -- another great citizen planner-driven blog tracking development in their community. 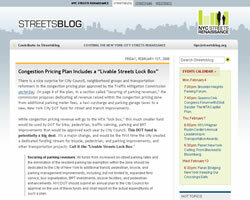 StreetsBlog provides unparalleled coverage of transportation and planning issues in New York City, making it the envy of transportation advocates in cities across the country. Part of the NYC Streets Renaissance Campaign sponsored by the Open Planning Project, the website supports the group's efforts to reorient the city's transportation policies away from the car and towards cyclists and pedestrians. Daily updates on issues from congestion and parking pricing to road and sidewalk design make StreetsBlog a must read for anyone who's interested in creating sustainable transportation policies. 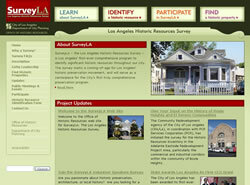 The SurveyLA website is part of the City of Los Angeles' Historic Resources Survey – a five-year effort partially funded by the Getty Foundation to identify all the historically significant buildings and structures in the city. In addition to providing information about the project to the public, the website allows visitors to participate firsthand in the multi-year planning effort by identifying historic resources through an online survey form. In addition, visitors can search for already surveyed properties, and view images of the city's historic and cultural landmarks. Full disclosure: Planetizen's parent company, Urban Insight, was hired by the City of Los Angeles and the Getty Foundation to develop the SurveyLA website. 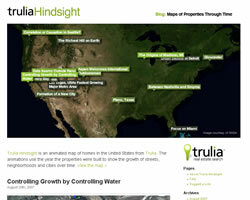 A side project of the real estate website Trulia.com, Hindsight uses home sales data to create animated maps of development over time. Using color coded dots on the street grids of modern urban areas - visitors can watch as the population of Plano, Texas doubles in a decade and examine the effect of growth controls on towns like Bolinas, CA. You'll be hard pressed to find a more vivid digital portrait of how cities grow. Looking to find a house where you don't have to get in your car every time you want to get a gallon of milk? That's where Walk Score comes in. Enter your address, and it finds the distance to the nearest grocery stores, post offices, restaurants, libraries, movie theaters and other useful destinations, and then assigns a score based on the walkability of your location. 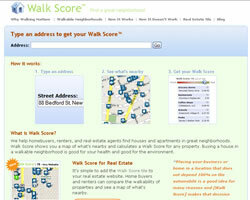 Walk Score is the perfect tool for anyone looking to find a home or office in a walkable neighborhood.